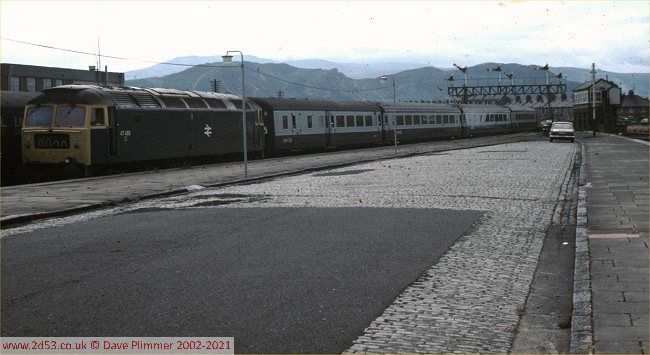 Terminus of the branch from Llandudno Junction, Llandudno station in the late 1970s was a shadow of its former self - yet was still busy with excursion and 'Saturday's only' trains in the summer months. 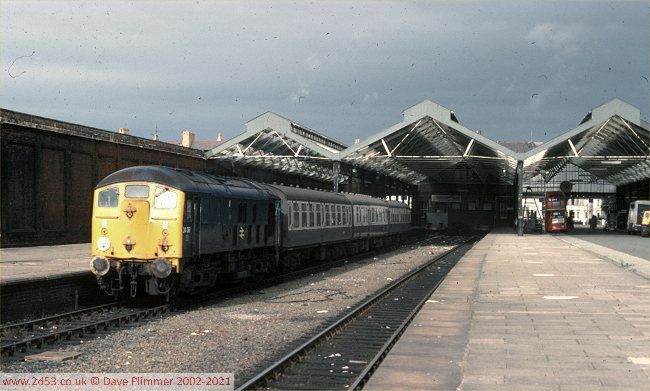 On 24th July 1976, 47486 reverses the empty stock of 1D53 10:25 SO Euston to Llandudno out of Platform 2. The raised shunt signal indicates the train is heading for the carriage sidings so that the loco can run round before forming the 15:53 back to London. 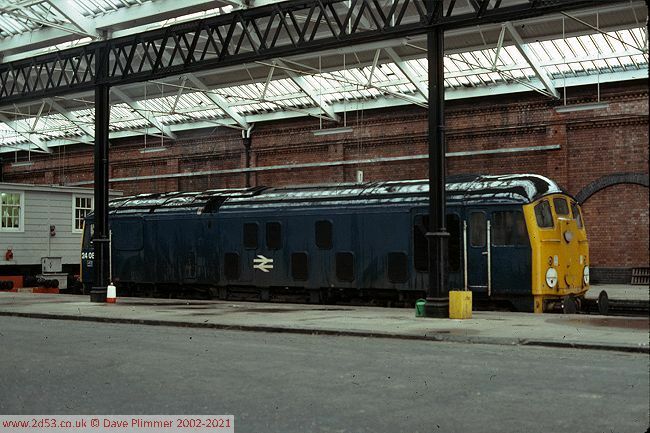 Note the Mark III carriages - this diagram brought Mark IIIs to North Wales for the first time, and the 1976 WTT shows this as the only air-conditioned working along the coast line. The signals are also off for the 14:42 to Manchester to leave from Platform 1, showing that this is the pre-rationalisation layout, which allowed parallel moves. Note that the gantry carries signals for Platform 3. In 1978, these were removed and placed on a separate bracket signal, since replaced again. Another pre-rationalisation photo, as 24081 waits in Platform 4 with a Llandudno - Holyhead 'Shoppers Special'. This train was run to cater for day trippers from Ireland. Not advertised in the BR timetable, it collected passengers from the 12:30 arrival at Holyhead from Dun Laoghaire, and returned them in time for the 18:30 sailing back to Ireland. 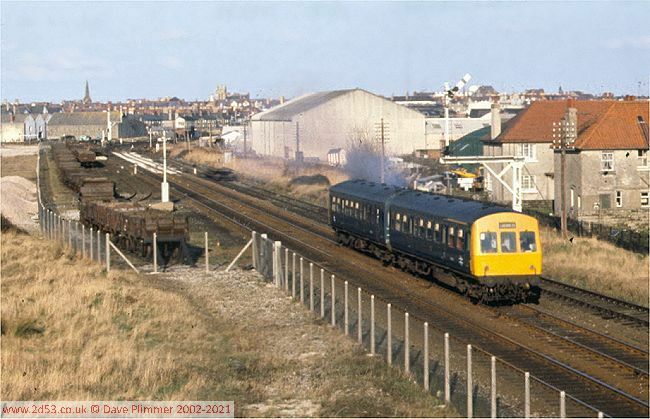 A dmu leaves Llandudno on a short trip to the Junction on the 11th of February 1978, at the time that the track layout and signalling at the terminus were being rationalised. New fencing surrounds the much reduced carriage sidings, full of engineers wagons. 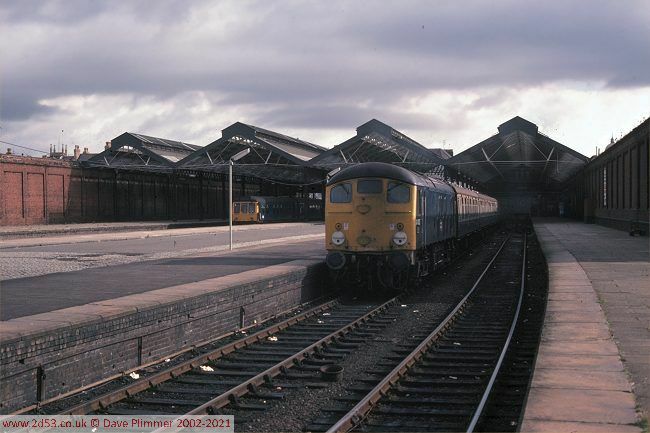 At this time, the number of platforms available for arrival and departures was reduced from 5 to 3 - the other two platforms remaining as carriage sidings. Nearly 2 months later, the 24 diagram is still running. Once again 24082 is in charge as it waits at a quiet Llandudno station with the 09:42 to Manchester Victoria. Alonside in Platform 3 is the 09:36 departure for Blaenau Ffestiniog. ECS. After working 09:28 from Birmingham NS. To work 18:30 to Euston. After working 08:41 from York. DMU. ECS, After working 23:06 from Llandudno Jcn.